There appears to be no recorded history of organized soaring in the Dallas area prior to WW II. It seems, however, that after the war, veterans and other aviation minded folks wanted to experiment with this intriguing and relatively new “sport” of flying without an engine to remain aloft and even make short cross-country flights. In the decade before WWII only a few dedicated souls recognized the ability to remain in the sky supported by natural updrafts (mainly associated with upslope wind on hills). During the war, however, training for military glider pilots required a significant production of two-place training gliders and exposure to natural up drafts opened up many minds about the fun of staying aloft using nature’s power. Thus, after the war cheap gliders were available, and since launching was a team effort, it also provided a built-in social group for these people of like interests. A group of these early enthusiasts are shown below in front of a TSA WWII Schweizer TG 3 training glider. Prior to TSA being organized, a group of enthusiasts soared out of a little light-plane field located near Love field in downtown Dallas, and TSA was soon born. Although it is hard to imagine today, this location worked fine at the time. If a DC 3 or two and a few bi-planes were landing at Love Field it was no big problem. As time went on, however, the owner/operator of the glider group’s home field began to see the glider operation as an interruption of routine. Thus, after the organization began a series of short tenures at various small airports in the Dallas area, and it became apparent that owning a soaring site dedicated to glider operations was not only desirable but it was imperative for survival. Lucky for TSA today, the forward thinking members were able to make it happen. About this time (in the late 1940s), several soaring enthusiasts in the Dallas area were instrumental in associating with the national organization, [SSA]. At the same time these guys were also involved in creating the Texas Soaring Association to "encourage development of motorless flight in Texas”. A Texas non-profit charter was incorporated, TSA insignia was adopted, and the newsletter, SPIRALS, was first published. In the early years, TSA struggled to make ends meet and much of the activity was supported by private donations and gifts from a few of the founding fathers. A small yearly fee was required, but there were no monthly dues. Capital investment was minimal since the equipment was WWII surplus and probably was owned by individuals and "loaned" to others in the club for the few flights made during the year. At the time the surplus equipment was cheap and “set-asides” for maintenance and insurance were unheard of. During the 1950s, TSA operated at an excellent airport located in what is now downtown Grand Prairie, Texas. This site, a WWII pilot training site, was perfect. 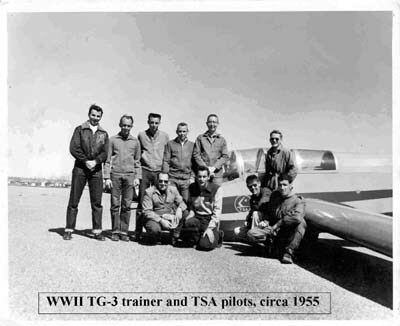 It was operated by a local college as an aviation educational facility, had long paved runways, numerous buildings, and a row of glider hangers which was erected by TSA members. In 1960, the facility was reclaimed by the government to be used by military reserve units. Thus, it was move time again for TSA. Fortunately, the hard work and donations of its members began to pay off and TSA found itself in a financial position to buy property and begin TSA’s own independent gliderport operation at a location a few miles south of Grand Prairie. During the 60s and 70s, TSA operated at this location, trained many pilots, bought more and better gliders and tow planes, and had lots of fun. Because of air-space restrictions and nearby lake construction, TSA was forced to move again. This time, at 30 miles from downtown Dallas, TSA felt that it would be secure for the next half century as a minimum. .... Surprise, Surprise!! .... Within 5 years, air space issues again threatened TSA. With much work, negotiations, pleading, reasoning, and begging, TSA leaders were able to carve a small slice from the proposed 30-mile radius class B airspace. Improvements to the site over the years include a two-story clubhouse, a large tow plane hangar and workshops, covered hangar space for fifty gliders and a 4,300 foot paved runway. Today, TSA without question has the finest facilities of any dedicated glider operation in the United States! TSA now has approximately 180 flying members including many youth members who participate in the club’s youth soaring program. The club membership is highly varied. It includes men and women from all walks of life. The club also includes among its membership many serious competition pilots, including several national soaring champions and members of the US National Soaring Team. However, many members fly locally on weekends and enjoy the sport from a non-competitive standpoint. TSA members also volunteer their efforts to advance the sport of soaring on a national level. Several serve now or have served as president of the SSA and many have served on the board and contributed in other ways. 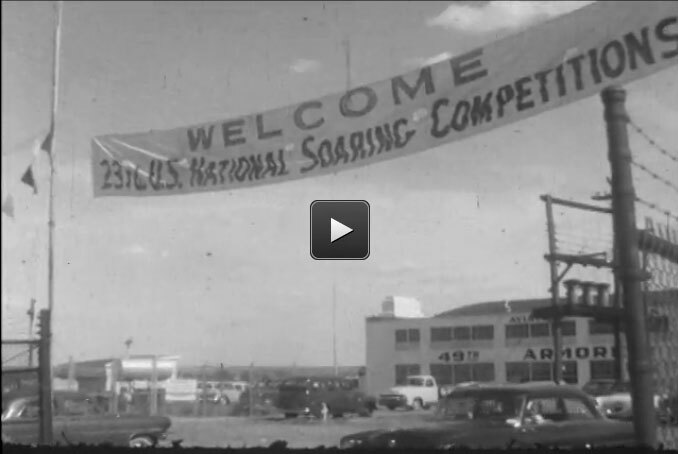 A part of University of North Texas "The Portal to Texas History collection, this B-Roll (no audio) footage shows pilots at the August 5, 1956 nationals held at Grand Prairie airport.